The day has finally arrived, the Linux-powered Atari VCS games console can now be pre-ordered and they finally have the specifications up too. As I was hoping, they've released a lot of the hidden details, so it seems they were saving it to make a big splash. Seems like IndieGoGo is currently under a lot of strain thanks to this too, quite hard to get it to load. After reading it through and taking it all in, I have to say my excitement for it has increased once again. Although, I'm still remaining cautious in my optimism for it (especially as their timeline shows they're still in the prototype stage - with the second prototype due in Q3). It's already a huge success, at time of my last refresh of their page it's already hit over $550K in pre-orders! They finally revealed that the system they're using is based on Ubuntu, specifically with the 4.10 Kernel. It has a Bristol Ridge A1 CPU, with a Radeon R7 GPU so it's not exactly a powerhouse. It will come with 4GB DDR4 RAM, 32GB eMMC, with support for SD cards and external drives too. Naturally, it will also support most of what Ubuntu does including Bluetooth and USB devices, mouse, keyboard, Twitch streaming support, webcams and so on. Their classic joystick ($29) and modern controller ($49) are optional accessories, they don't come as standard. As for the size of it, the dimensions are 14.5" x 5.3" x 1.6" (approx 36.83cm x 13.46cm x 4.06cm) with a weight of 3 lbs (approx 1.36kg). So it's small, light and it looks pretty good. Honestly wouldn't mind one of those sat next to my TV. It will come with 100+ classic Atari games pre-loaded and they will also have their own 'Atari VCS Store'. They say they've teamed up with a 'leading industry partner' they're going to announce shortly. Sounds exciting, but I will stop short of saying it's Valve (which I'm sure a few of you are thinking). It would make sense to be Valve though, given their massive Linux catalogue of games, but who knows maybe even GOG? Access the Linux Sandbox, add more storage via cloud or USB, run multiple operating systems at once, load Homebrew games or customize your own unique platform. They might lock the actual games behind a wall, which would be a shame. Although, that wouldn't be too different to buying games directly on SteamOS. They are also saying it will support Linux games from Steam and other platforms, as long as they meet the hardware requirements. Find it on IndieGoGo. The cheapest option for the console itself is the "Onyx Early Bird" at $199, which goes up to $349 for the "Collector's All In" bundle which includes both the classic stick, modern gamepad and the wooden-styled front. An interesting question remains in my mind though, is this still "Linux Gaming" as we think about it or is this a whole new thing? 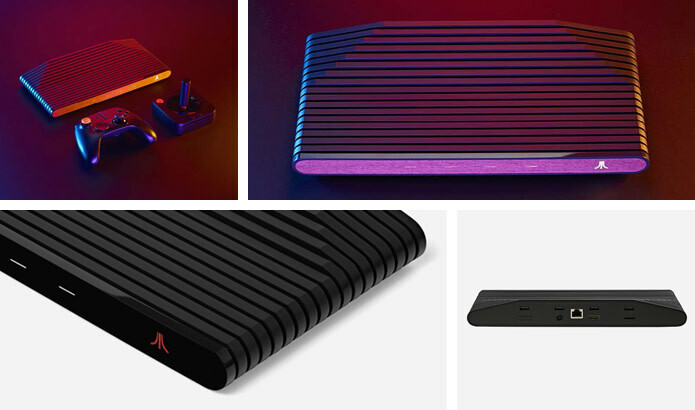 Would readers be interested in us covering future Atari VCS news if we picked one up? I would be interested in GOL covering it ut I have to agree in pausing to call it Linux gaming. For me the big thing will be if you can install any game you want onto it or if you will be locked to their store. For me part of Linux is freedom and being locked down kind of goes against that. I would also be interested in whether I could load a different OS. See this is why consoles aren't for me: the first thing I try to do with them is make them into something other than a console. PublicNuisance I would be interested in GOL covering it ut I have to agree in pausing to call it Linux gaming. For me the big thing will be if you can install any game you want onto it or if you will be locked to their store. For me part of Linux is freedom and being locked down kind of goes against that. I would also be interested in whether I could load a different OS. See this is why consoles aren't for me: the first thing I try to do with them is make them into something other than a console. Well, as we quoted them, you can still access the Linux system and add other games in from Steam and so on as long as it supports Linux. Seems pretty open. On the indiegogo page, it does mentions steam, but not as a partner. It is under the "Playing Games On Atari VCS" section. "Will you be able to play Steam Games on Atari VCS? Yes. Linux-based games from Steam and other platforms that meet Atari VCS hardware specifications should work." tmhorne On the indiegogo page, it does mentions steam, but not as a partner. It is under the "Playing Games On Atari VCS" section. This device will be a major disappointment to everyone who will buy it to play Steam games in Linux... I wouldn't buy it for any other use as your phone can already do better all the other tasks (including Atari emulation). And yes, I did try to use Steam Link from my phone. Yeah, my first experiences with Indiegogo and it went bad. Entered my credit card info and pushed the button... and it says error, but I can see the payment as being processed on my bank account. Nice. Haven't had any issues at all with Kickstarter so far, I hope Indiegogo support will solve this. Grml. My money has this winding up on the bottom shelves of box stores once kept warm by the orange stacks of OUYA. This console is still mostly a solution in search of a problem. The one thing it could possibly do to be a category killer is to get PC back into the fight for the 4K HDCP streaming video market, where it is dying horribly. Quote As for the size of it, the dimensions are 14.5" x 5.3" x 1.6" with a weight of 3 lbs. So it's small, light and it looks pretty good. Honestly wouldn't mind one of those sat next to my TV. Would you mind using international metric system, and not this nonsens empiric not-scientifically-based mesures ?